I've been suffering from ISLAND FEVER. If you've never lived on an island, in the middle of the great Pacific ocean, then you probably wouldn't know what I'm talking about and it would do you good to continue reading. There is a constant battle in my belly. On the one hand, Hawaii is my home and where I would love to raise children. On the other, I have seen enough of the world to know that I want to see more! Hawaii is home to me. 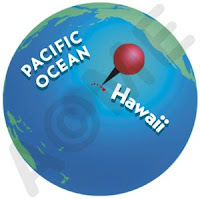 I am part-Hawaiian... part of my ancestry leads to the indigenous people of these islands. I love the "locals" and the food and the weather and the beautiful beaches, etc, etc. There's so much to love! I feel very comfortable here, safe, and secure. All my immediate family are still here on this island. Why would I want to leave? There's a great big world out there to explore. I have desires to do an Aboriginal Walkabout and get in touch with my Dreaming. I would love to ride an elephant in Thailand. Visit India and sit in the courtyards of the Taj Mahal. I see myself running with lions on the African continent. I can find my own green stone in New Zealand. Visit the land of my Samoan ancestors. I am an explorer, yearning to explore. Living to quench my thirst for adventure. I'm suffering today from ISLAND FEVER, a severe case of wanting to FLY! Wanted to say hello! How's it going?